Confirmed Lineups: Sunderland vs Liverpool Lineups have been revealed by both the cubs Sunderland and Liverpool for the Premier League game. 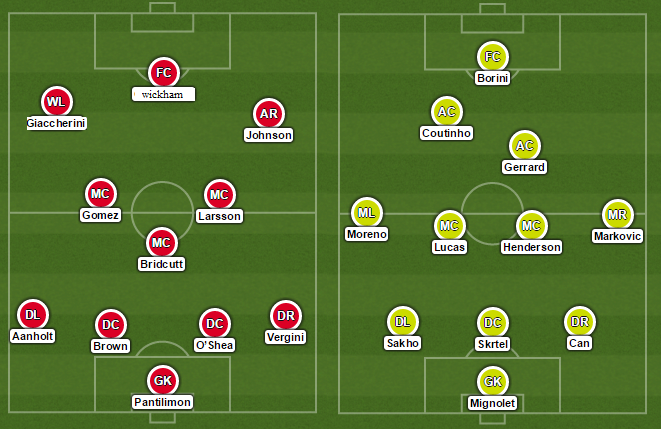 Lineups have been revealed by both the cubs Sunderland and Liverpool for the Premier League game. Sunderland manager Gus Poyet has made some changes. Costel Pantilimon remains on the goal, with Santiago Vergini and Patrick van Aanholt on the full-back position and former Manchester United duo John O’Shea and Wes Brown in the centre of the defence. Midfielders Jordi Gomez and Sebastian Larsson starts with Liam Bridcutt taking a deeper role. Adam Johnson starts on his favourite right wing role and Emanuele Giaccherini on the other side. Connor Wickam to lead the line alone. Starting Eleven: Costel Pantilimon, Santiago Vergini, John O’Shea (c), Wes Brown, Patrick van Aanholt, Liam Bridcutt, Sebastian Larsson, Jordi Gomez, Adam Johnson, Connor Wickham, Emanuele Giaccherini. Substitutes: Billy Jones, Danny Graham, Ricardo Alvarez, Will Buckley, Mikael Mandron, Steve Agnew, Vito Mannone. Liverpool manager Brendan Rodgers has also made some changes in the lineup. Raheem Sterling is rested and Fabio Borini starts inplace of him. Philippe Coutinho continues this time with Steven Gerrard behind the striker as Adam Lallana is out with an injury. Midfielders Lucas Levia and Jordan Henderson start in the centre. Alberto Moreno and Lazar Markovic from the flanks. The back three remains the same Emre Can, Martin Skrtel and Mamadou Sakho with Simon Mignolet in goal. Starting Eleven: Simon Mignolet, Emre Can, Martin Skrtel, Mamadou Sakho, Lazar Markovic, Jordan Henderson, Lucas Leiva, Alberto Moreno, Steven Gerrard (c), Philippe Coutinho, Fabio Borini. Substitutes: Danny Ward, Jose Enrique, Dejan Lovren, Rickie Lambert, Javi Manquillo, Mario Balotelli, Jordan Rossiter.